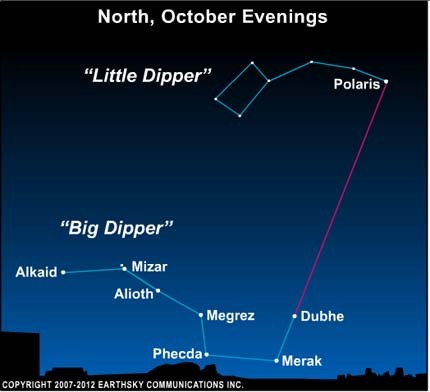 EarthSky Tonight—Tonight Oct. 27, Where is the Big Dipper on these autumn evenings? Where is the Big Dipper at nightfall and early evening? At this time of year, the most famous star pattern visible from this hemisphere – the Big Dipper – lurks low in the north during the evening hours. It is tough to spot the Dipper in the evening at this time of year, especially in the southern states, although you will see it before dawn around now, ascending in the northeast. The distances of the stars in the Dipper reveal something interesting about them: five of these seven stars have a physical relationship in space. That is not always true of patterns on our sky’s dome. 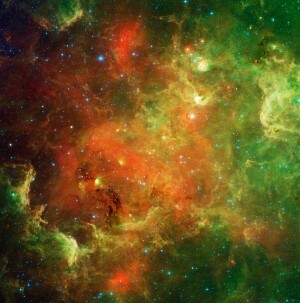 Most star patterns are made up of unrelated stars at vastly different distances. However, Merak, Mizar, Alioth, Megrez and Phecda are part of a single star grouping. They probably were born together from a single cloud of gas and dust, and they are still moving together as a family. The other two stars in the Dipper — Dubhe and Alkaid — are unrelated to each other and to the other five. They are moving in an entirely different direction. Thus, millions of years from now the Big Dipper will have lost its familiar Dipper-like shape. To find the Big Dipper’s place in the sky, remember the phrase: spring up and fall down. That is because the Big Dipper shines way high in the sky on spring evenings but close to the horizon in autumn. Site contents copyright © 2019 Recorder Online	except as noted. All rights reserved. | 83 queries in 1.207 seconds.